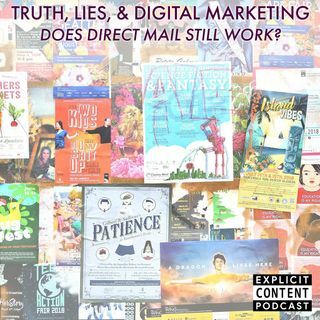 Digital Marketing - Direct Mail Comeback? Do you personalize your marketing approach? This week on the Explicit Content Podcast, your hosts Katie Martell and Lindsay McKinney discuss content mediums that work and the “what’s old is new again” approach. Marketing concepts such as direct mail are resurfacing with clear effectiveness. First impressions are vital in today's market: especially when it comes to building new clientele. Many companies bombard the prospective client with mass e-mails. ... See More Today’s target demographics expect a personal approach. On this week's episode, listen to a lively discussion regarding what's old is new again and the revival of adding a personalized touch in a market that is often overshadowed by technology. Thank you for listening to the Explicit Content Podcast. For more information, check out enterprisemarketer.com.